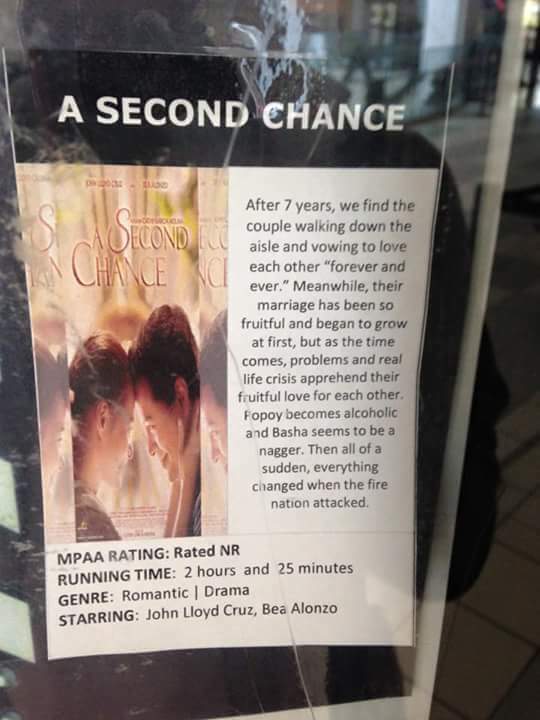 A Movie Theater In Guam Has A Funny Synopsis For The Filipino Film "A Second Chance"
The Tagalog movie A Second Chance starring Bea Alonzo and John Lloyd Cruz was recently shown in some theaters in Guam. It's not that surprising given the fact that between 25% and 30% of the island's population is composed of Filipinos. Whether you are a fan or not of the romantic film, we're sure you're going to find the following synopsis hilarious. "After 7 years, we find the couple walking down the aisle and vowing to love each other "forever and ever". Meanwhile, their marriage has been so fruitful and began to grow at first, but as the time comes, problems and real life crisis apprehend their fruitful love for each other. Popoy becomes alcoholic and Basha seems to be a nagger. Then all of a sudden, everything changed when the fire nation attacked." What happened? Did the movie's distributor hire a six-year old to pen the synopsis? You can count at least a dozen grammar issues in the thing. And that Avatar bit at the end is just weird. Maybe the writer of the synopsis is trolling. If he is, then hats off to him. You are a master troller. If not, then this is just sad. Somebody needs to pick up a grammar book or any book for that matter.